The Grado Gradoo Numbers ONLY! Plaque is a very modern looking address plaque that consists of bold easy to read numbers. Everything is removed except the address numbers from the popular Grado Gradoo Address Plaque. The Grado Gradoo font was not designed until 2002, has big and bold numbers, and definitely has the Arts and Crafts feel to it. 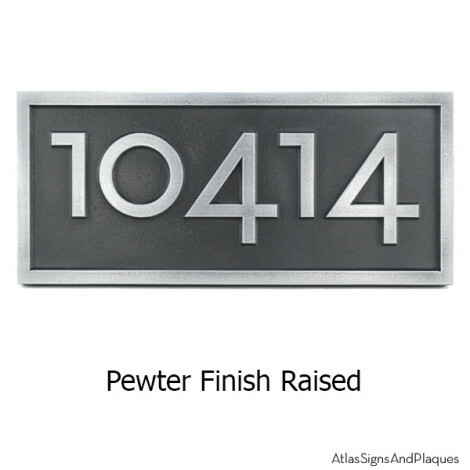 This is a really classy number plaque for your Craftsman, Arts and Crafts, Bungalow, or Prairie Style home. This entry was posted in NEW - Be in the KNOW and tagged address, bold, custom, decorative, easy to read, finished, house numbers, metal coated, New, numbers, numbers only, personalized, street numbers on September 5, 2014 by AtlasSigns.